The old farmer was trying to be the best patient he could. The doctor was trying to be the best caregiver he could. The message, in this short story by a DMS faculty member, is that treating the disease isn't all there is to medicine. That popular-song lament is also a question that's puzzled epidemiologists for the past half-century. Was it really rural well-water that made hundreds of infants turn blue? Why did the number of cases suddenly decline? As this saga by a member of the DMS faculty indicates, the annals of science will always, by their very nature, be incomplete. Central auditory processing disorder is to the ear as dyslexia is to the eye. Just as dyslexics can see the words, but some letters get jumbled in their brains, those with CAPD can hear, but their brains can't process some sounds. The disorder is often misdiagnosed, but that will change if DHMC's Frank Musiek has his way. The news this issue ranges from the familiar (the annual tradition of Match Day) to the offbeat (a study that uses tattooed students as research subjects). "Geoffrey Birchard, Ph.D. '86: Devoted to dragons"
"Lisabeth Maloney: Putting medicine in perspective"
"A new look at diabetes"
By Paul J. Beisswenger, M.D. By John C. Baldwin, M.D. 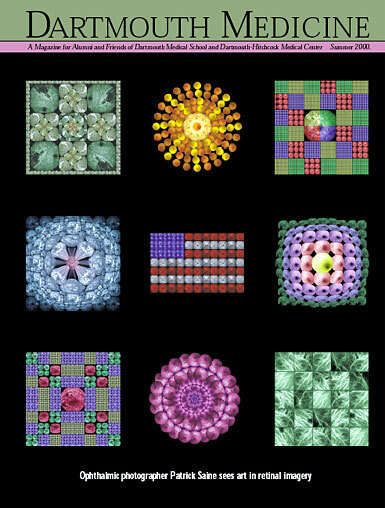 These kaleidoscopic works of art are a by-product of Patrick Saine's work as a certified retinal angiographer. The accompanying story, which starts on page 38, describes how he stumbled onto a process that has brought him much creative fulfillment. Dartmouth Medicine seeks to convey the breadth and depth of the education, research, and patient-care activities of DMS and DHMC; to serve as a publication of historical record; to stimulate thought and discussion on issues in medicine and medical education; and to reflect the range of opinions and activities among Dartmouth medical students, faculty, and alumni. Among abbreviations used regularly in these pages are DMS (Dartmouth Medical School), DHMC (Dartmouth-Hitchcock Medical Center), MHMH (Mary Hitchcock Memorial Hospital), DC (Dartmouth College), and HS (housestaff). The opinions of contributors do not necessarily reflect those of DMS or DHMC. Dartmouth Medicine is published four times a yearin Fall (September), Winter (December), Spring (March), and Summer (June). It is produced using a Macintosh G3 and Quark XPress 4.04. We are happy to send Dartmouth Medicineon a complimentary basis to anyone who is interested in the subjects that are covered in the magazine. Write us if you'd like to be added to our rolls. We regret, however, that the complimentary subscription offer can be extended only to addresses within North America. Because our mailing list comes from eight separate databases, some readers may receive duplicate copies. Please share extra copies with someone else, or send us the address panels from all the copies you receive and we will be glad to eliminate the duplication.